Makes: around 4 Servings of Cilantro Coconut Raita. Wash, separate leaves and roughly chop the cilantro leaves. Grind cilantro leaves, coconut, green chiles and salt into coarse paste adding sufficient water. Whisk yogurt with little bit of water in a bowl and stir in freshly ground cilantro coconut paste. When mustard seeds start spluttering, add ginger and briefly fry. Remove from heat and add to above raita bowl. 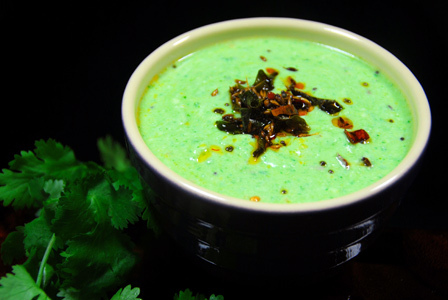 Serve cilantro coconut raita with steamed idly or with dosa or with rotti. Notes: Make sure not to over grind the cilantro leaves. Variations: Check other raita recipes here. Other Names: Cilantro Coconut Raita, Kobbari Kothimera Perugu Pachadi. Fresh or dried tender tamarind leaves are mixed with yogurt and seasoned with fried spices. Serve tamarind leaves raita with steamed rice or with roti. Makes: around 2 Servings of Tamarind Leaves Raita. Wash fresh tamarind leaves and roughly chop them. If using dried tamarind leaves, soak the leaves in enough warm water for around 5 minutes and strain the leaves. In a mixing bowl, whisk yogurt with few tablespoons of water. Stir in tamarind leaves, chopped onion and salt. When mustard seeds start spluttering, add green chile and remove from heat. Once the above spices cool down to room temperature, add it to the above yogurt bowl. 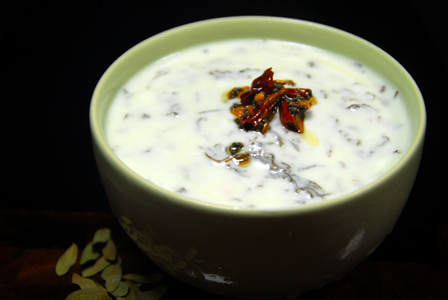 Mix well and serve tamarind leaves raita with steamed rice or with roti. Notes: Make sure tamarind leaves are soaked well if using dried leaves. Suggestions: Adjust spice with green chiles. Adjust consistency with water. Variations: You can also cook the onion with spices before adding to the yogurt. Check other tamarind leaves recipes here. Other Names: Tamarind Leaves Raita, Chinta Chiguru Perugu Pachadi. Makes: around 2 Servings of Tindora Raita. Wash, remove little bit of both ends and grate the tindora using thick side of a grater. When mustard seeds start spluttering, remove from heat and add the chopped cilantro leaves. Whisk yogurt in a bowl, add grated tindora, above talimpu and salt. Notes: Make sure tindora is raw. Suggestions: You can also add silced green chiles along with red chiles if you wish. Other Names: Tindora Raita, Dondakaya Perugu Pachadi. Makes: around 4 Servings of Broccoli Slaw Raita. When mustard seeds start spluttering, add broccoli, carrot and salt. Cook for a minute and remove from heat. Whisk yogurt in a mixing bowl, stir in above broccoli carrot slaw. Notes: Don’t overcook the broccoli slaw. Suggestions: Adjust the consistency of raita with yogurt. Variations: For extra spice, add green chiles along with red chillies. Garnish with finely chopped cilantro. Other Names: Broccoli Slaw Raita. Whisk thick plain yogurt with spices. Slice the onion and julienne the fresh cucumber. Add it to yogurt along with fried spices and herbs. 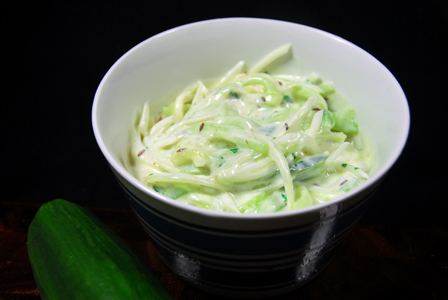 Serve cucumber onion raita with biryani or with pulao. 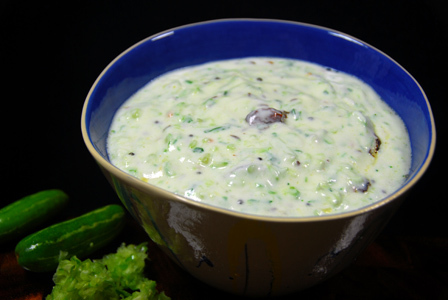 Makes: around 3 Servings of Cucumber Onion Raita. Remove ends, peel, wash and julienne the cucumber. Whisk yogurt in a mixing bowl with salt, cumin powder and keep aside. Add sliced onion and cucumber to the mixing bowl. Heat oil in a small pan, add cumin seeds. Then add sliced green chiles. Fry till cumin seeds change color, add chopped cilantro and remove from heat. Cool this to room temperature and add to the mixing bowl. 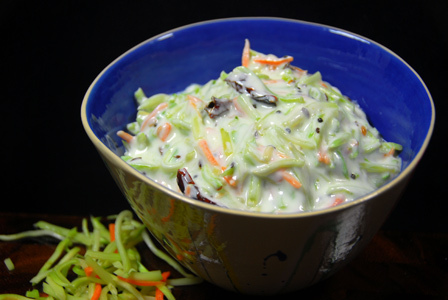 Mix well and serve cucumber onion raita with biryani or with pulao. Notes: Make sure to julienne the cucumber. Suggestions: Adjust spice with green chiles. Adjust the consistency with yogurt. Variations: You can also fry the onion along with green chiles before adding to the yogurt. Other Names: Cucumber Onion Raita.